Written and photographic documentation are an essential part of any conservation treatment and are required by the American Institute for Conservation of Historic and Artistic Works in their Standards of Practice. Our policy is thus to write an Examination Report and a Post Treatment Report which will document the treatment and materials used on the textile. A before and after digital photographic record will be taken and kept on file at TCW as a visual comparison of conservation treatment. This is a required first step for any treatment. The initial treatment report is a required document that details the steps, materials and time to treat the textile. Documentation for Insurance Claims is also a service provided by our center. The TCW can prepare an Examination and Proposed Treatment Report with estimated cost of treatment, and expected results of treatment to facilitate resolution of the claims process for insurance companies. 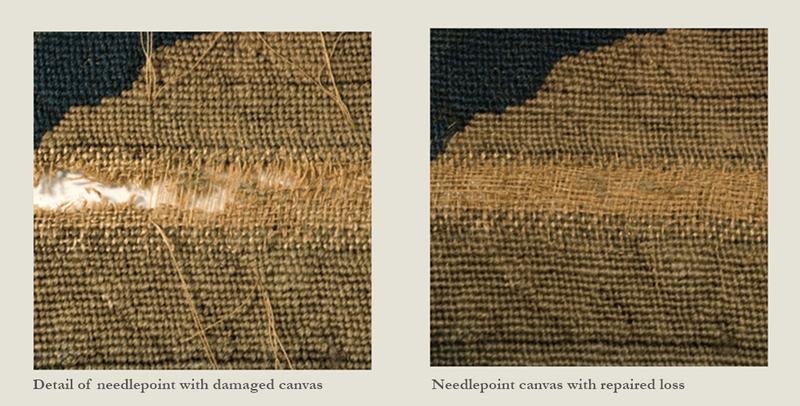 This documentation can be prepared at TCW if the damaged textiles are able to be transported or a conservator can travel for an on-site consultation (see Services). Our staff is trained to help navigate the documentation process when recovery of collections is sought from FEMA, SBA, NEH, NEA, NCPTT and IMLS. The examination process includes testing for dye-fastness. On-site evaluation of damage for insurance claims. Cleaning removes soil that, if left, can accelerate the deterioration of a textile. The acidic nature of most soils can hasten degradation, and some soils can abrade the fibers of a textile. The cleaning of a textile will serve to not only improve the pH but also the overall appearance. The treatments available for cleaning include such procedures as dry surface cleaning, vacuuming, localized spot cleaning, wet cleaning, dry cleaning and suction table cleaning. When textiles show evidence of an active insect infestation, fumigation treatment should proceed immediately. Vacuuming combined with freezing and/or dry cleaning is the method of insect eradication we choose. Your piece will be thoroughly vacuumed before and after repeated freezing cycles, in a freezing chamber. The success of the treatment relies on the rapid freezing to a very low temperature and slow thawing of the object. The process is repeated two or three times over a one to two week period, with intermittent vacuuming. Heavily infested textiles will require more cycles. The suction table permits controlled application of solvents in cleaning. Cycle of rapid freezing and slow thawing curtail insect infestations. Support patch inserted behind 19th century roller printed fabric on child's dress. 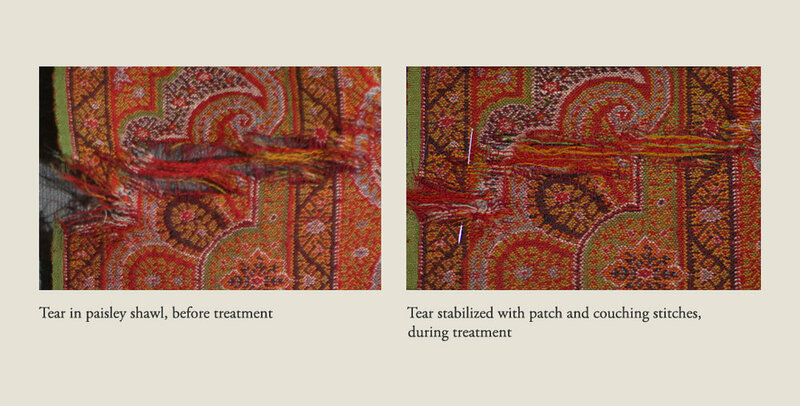 The stabilization and repair of textiles with fine sewing techniques and specialized materials serves to improve the structural integrity of the piece and compensate for losses. Over time, fabric inevitably becomes dry and loses flexibility so that fiber powdering and breakage is common. Through diverse stitch patterns and supportive fabric layers, the piece can be improved in appearance and strength. 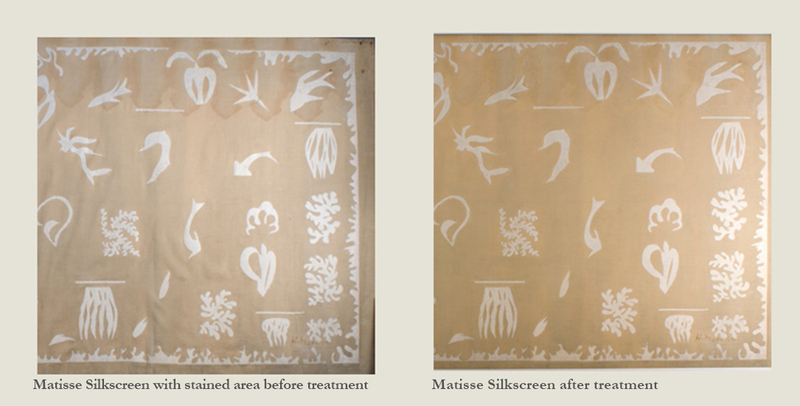 The procedures used to effect this in textile conservation are darning and couching repairs, addition of net or fabric overlays and underlays, uses of supportive straps for heavy hangings, the addition of backings and linings, and sewing slits or breaks. Insertion of silk compensation fabric held in place with adhesive-coated threads. The consolidation of fragmented silks and other fragile fabrics, when appropriate, can be achieved with various adhesive techniques. The range includes minimal local repairs including adhesive-coated threads, gossamer tissue and patches as well as overall lining to a thin, sheer support fabric. The adhesive selected is chosen for its excellent ageing and archival properties and its appropriateness for the textile and type of repair. Paint on textiles is frequently in need of consolidation due to flaking or powdering. This is often achieved with the aid of an ultrasonic nebulizer that breaks up the appropriate consolidant solution into tiny particles and delivers it in a vapor-saturated mist. The consolidant is thus encouraged to sink below the surface of the paint where it is needed to reaffirm the pigment to pigment and pigment to fabric bonds without changing the color or sheen of the paint layer. A mount is a rigid support such as a ragboard or archival panel that is encased in a neutral fabric envelope. The antique textile is then sewn to the mounting fabric. This reduces movement and flexing of the textile, thus damage is less likely to occur. Typically, the mount is then framed, further protecting the antique textile. If original and historically pertinent mounting elements are intact, and if it is possible, these mounting elements will be reworked for use with the conserved textile. Three dimensional textiles can also be prepared for safe display on custom-designed forms. Padded mounts, Plexiglas forms, mannequins and carved Ethafoam shapes can all be created to give internal support to the object while on exhibit or in storage. A sampler being hand-stitched to a fabric covered ragboard in preparation for framing. Internal shaping was required to display this Torah mantle. The custom framing done at the Workshop employs archival materials and ultra-violet filtering glazing with glass or Plexiglas to help safeguard the future condition of each piece. We have a large selection of museum-quality, period style frames in a variety of finishes and a range of prices. We offer advice as to the appropriate choice for stylistic accuracy in framing and tasteful, functional matting. We also work in conjunction with a frame restorer and eglomise glass expert, who is an excellent craftsman with a true understanding of period frames and a fine sensitivity for repairing structure and finish without disturbing their aged appearance. For larger mounted objects such as quilts, flags and banners or other oversized textiles, we usually recommend a strong powder-coated metal frame. These frames provide the structural strength when hanging a large piece, and can allow for back viewing of double-sided textiles as well as further framing within a decorative frame, if so desired. Silk Mourning picture with eglomise glass mat and gilded frame. Large flag with powder-coated aluminum frame and UV glazing. 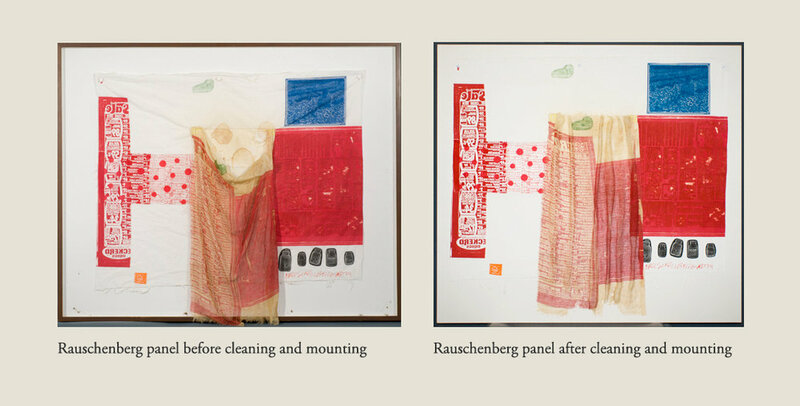 While we normally think of mounting and framing as the most useful method of display for textiles, other methods allow for the natural drape of the textile to be exhibited. Strapping, backings, linings, headers and Velcro hanging mechanisms assist in the transfer of weight onto new fabrics, thereby evenly distributing the stress caused by long-term hanging, preventing sagging, and scalloping. Linings and backings can also prevent dust and dirt accumulation on the reverse of the piece and potential abrasion from rubbing against a wall. 18th century tapestry conserved and prepared for hanging. Velcro and protective lining on reverse side of tapestry. Ethnic beadwork rolled on archival tubes within protective acid-free box. 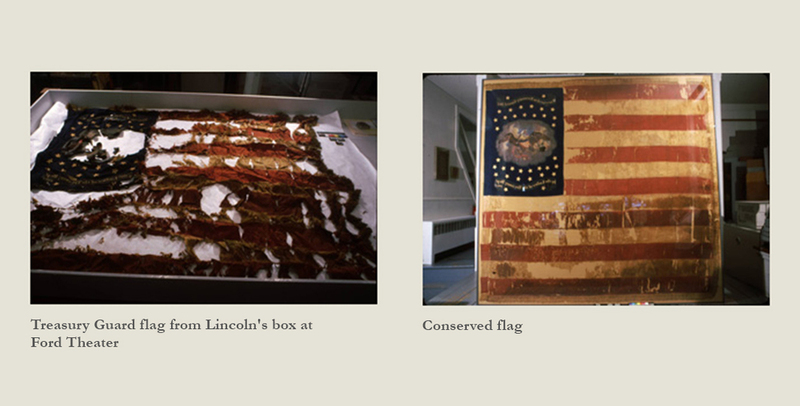 An acid-free storage box or roller and acid-free buffered or unbuffered tissue paper provide the best housing for textiles being retired to long-term storage or not on display in the museum. We further recommend that textiles should be stored in an environment which is dusted and vacuumed regularly and where the temperature and relative humidity remain fairly constant year-round. Storage in an attic or basement is not recommended, as the environmental changes in temperature and humidity are frequent and extreme. Too much moisture can promote mold growth, which can permanently damage a textile. Objects should be stored off the floor, out of direct sunlight and away from a radiator or any heating source. Reproduction of Red Cross nurse's uniform. 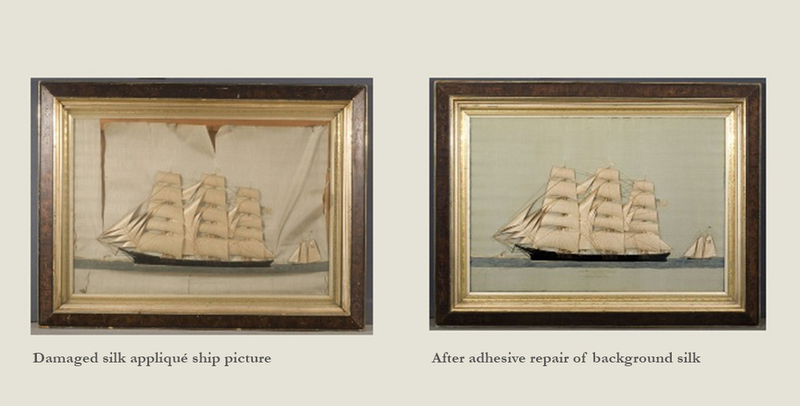 In some cases, heavy damage to an heirloom precludes normal conservation techniques and more extensive treatment is required to restore the visual and physical integrity of the piece. Stuctural fabric replacement and recreation of decorative elements can salvage the appearance and function of the textile. TCW and the owner can decide the extent of the restoration. At TCW, we specialize in treating original historic textiles. 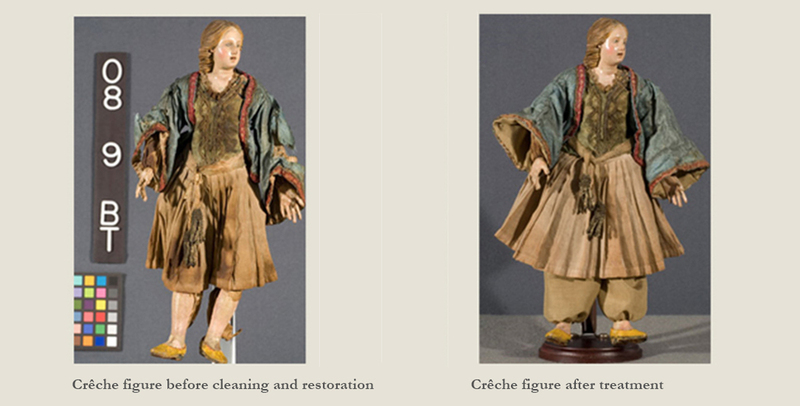 However, when historic textiles are too fragile and compromised by age and degradation, TCW conservators can construct reproductions for museums to place on exhibit. The original textiles can then be safely packed in archival storage, where they will remain protected for future reference and study. Reproductions are also suitable options for living history museum environments, which subject their textiles to the rigors of everyday utility.